MEA member Marti Alvarez makes a distinction between her job at Traverse City Area Public Schools and her reason for being. 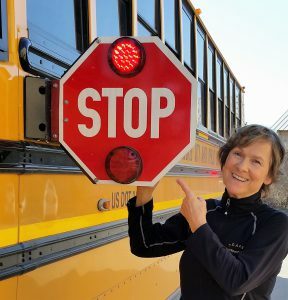 She is employed as a bus driver, but she is driven by a goal to help students be successful human beings – a message she spreads to colleagues doing every type of work in schools, whether it’s serving food, running an office, cleaning classrooms, or any other task. “It’s about empathy and higher purpose,” the 18-year veteran school bus driver says. Last weekend, Alvarez was presented with one of MEA’s highest honors for Education Support Professionals, the Leon A. Brunner Award, for her activism and leadership on behalf of kids and union members. Alvarez is known for having a big heart and an active imagination. When she sees a problem, she wants to solve it. Last spring, when a handful of fifth graders were given a six-week suspension from their morning buses for misbehavior, Alvarez proposed a solution that would keep them in school. She offered to drive them separately in a school district van. She understood the children – one as young as kindergarten – needed consequences for breaking the rules, Alvarez said. But she also knew any discipline that removes the students from school increases the likelihood they will drop out or get in more trouble in the future. “They would rather be at school, getting a meal and some positive attention,” she said. An added bonus of her temporary van program was getting to know those kids better, she said. She saw an improvement in their behavior, and a principal told her the change extended to the classroom as well. They still give her hugs when they see her, nearly a year later. Not all of the students made it to end of the year riding the van—a couple “couldn’t manage it,” she said. But it wasn’t for lack of trying on her part. Alvarez had a similar problem-solving reaction a few years ago when a kindergartener boarded the bus with painfully cold feet after waiting at a stop in sub-zero temperatures with no socks on. She credited NEA and MEA leadership training for giving her the confidence to do more than cry about the sad situation. She organized a community sock drive, coordinated by school bus drivers, which brought in thousands of pairs of socks for students in need. Alvarez has taken advantage of many training opportunities through the union, including the Minority Women’s Conference, Emerging Leaders, Powerful Public Speaking, and ACE Childhood Trauma Training. Since then, Alvarez has developed her own training – “Higher Purpose: Educators Employing Empathy for At-Risk Students” – which she has presented in Michigan and at NEA events around the country. She has served as TCTA secretary, union steward, MEA/NEA RA delegate, MEA/NEA board member, and Region 15A Coordinating Council Co-chair. In her spare time, Alvarez spins soul and blues music on a local public radio station and works as a DJ with her husband. She is a certified black belt with the World Taekwondo Federation, having trained in martial arts since 1978. The Leon A. Brunner Award is given annually to an ESP who exemplifies outstanding commitment and significant contributions to the field.